“I have to create a framework for future development of pattern-type, each server generated by plugins in this framework must have a specific software when a given role is used. I would like this behavior as much as possible transparent for the developer who use this framework. I think I have to use the TopologyProcessor”. That’s right, you have to create a TopologyProcessor which will modify the generated topology of the plugin to insert the “role” which will make the generic configuration. You can set your framework plugin to adjust all generated topologies by set the primary pattern-type as “foundation” and only some of them by adding a kind of filter in your topology framework. I want a plugin that runs some python scripts each time a topology containing the role “slave” is generated. I will call this plugin “plugin.mynameFoundationLab”, it will contain a role “config” and a topology processor. The topology processor will scan the generated topology and if the “slave” is found, it will insert my “config” role, the related package. 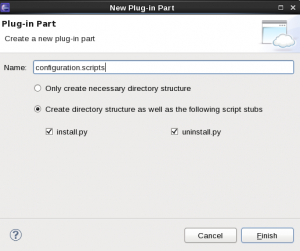 You can also play with the dependency and standard IWD Python scripts to have all scripts running in the correct order (See Deployment Documentation) but you will certainly then have to provide also some guidance to the pattern-type developers to be sure that the “config” scripts are called at the correct moment. 1) Create a new plugin called “plugin.mynameFoundationLab”. 3) Adapt the config.json to include the part. 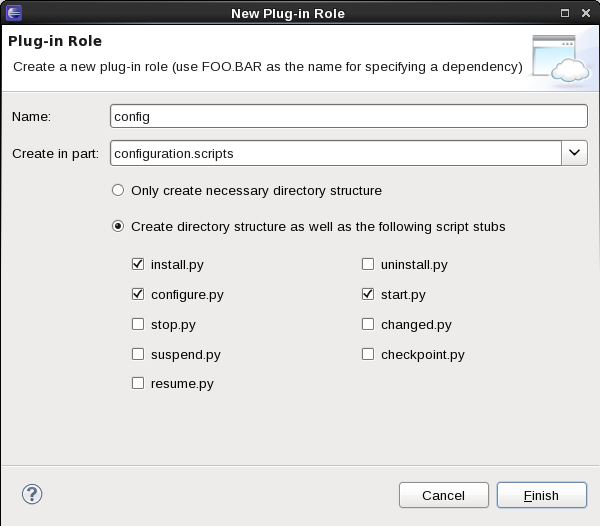 4) Create a new role called “config”. 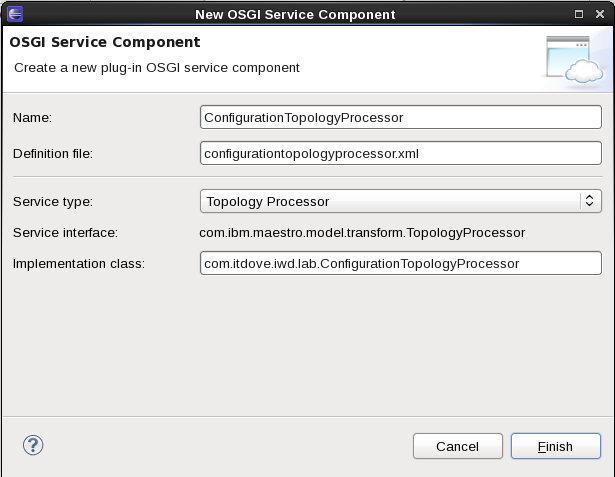 5) Create a new OSGI Service Component for the TopologyProcessor. 6) Adapt the TopologyProcessor java class to modify the generated topology. Please visit Part 1 to learn how to do that. Call the plugin “plugin.mynameFoundationLab”. PS: The PDK 1.0.0.4 version has a small defect, go to the MANIFEST.MF and remove the “singleton” part. Now you have to change the config.json to specify the related pattern-type. We must put as primary pattern-type the “foundation” and as we want to scan all pattern-types to search for the “slave” role, the secondary must be set as *.*. If you know the pattern-types you want to scan list here the concerned pattern-type. 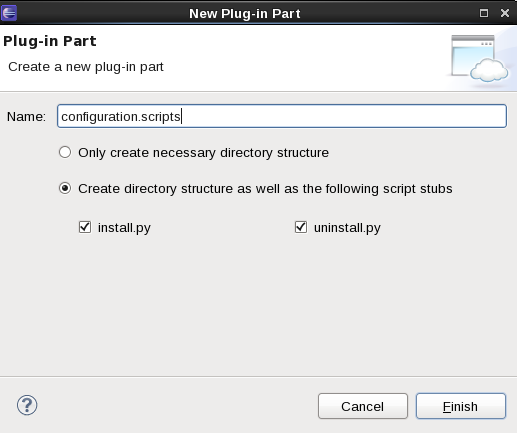 Using the PDK, right-click and select “New”->”Plug-In Role” and enter the following information. 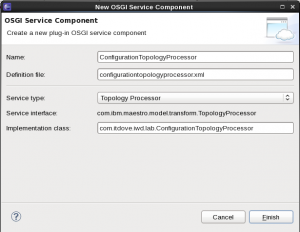 When we created the OSGI service automatically a java class called “ConfigurationTopologyProcessor” has been created. We have to implement our business logic in the “processTopology” method of this class. In our example, we decided to modify the topology only if the role “slave” is present, you could choose for other logic based on other attributes of the topology. Here the code I used to add the role and package. //For each template in the vm-templates element. //Search for the "slave" role. //If the "slave" role exists add the package and the "config" role. //If the packages element doesn't exist then create it. //add the package for the config plugin. 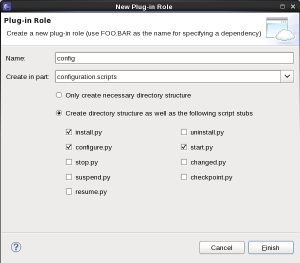 //Add the config role to the set of roles. – the “global”:true means that the role will be shown only once in UI in case of multiple instance of the “config” role will be generated. – the “dashbord.visible”:false means that the role “config” must not be shown in the UI. – You will notice also the usage of the getPluginName() and getPluginVersion() methods usage which are methods provided by the TopologyProcessor class. These methods allow me to retrieve the current value of the plugin name and version in order to construct the correct plugin path. N.B. : if you want to build a dependency, don’t forget that the role of the dependency must be the concatenation of the template name where the role is defined + “.” + role. Let’s build our plugin and upload it in the environment as a System-plugin. Then let’s launch the pattern containing a “slave” role as described in the previous exercise.